Now doesn't that look festive? A great contender for all those relaxed lunches that lie ahead in the next few days of celebrations. Let the countdown to Christmas begin! And let me tell you, it tastes just as good eaten straight out of the fridge. Not that I would ever... um... do that. 1. 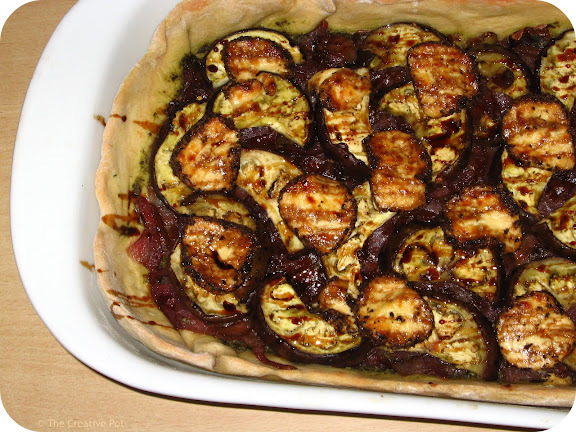 Toss aubergine with 1 tbsp olive oil, spread out onto a baking tray and roast at 180C for 15 - 20 minutes. Remove from oven and set aside. 2. Meanwhile, heat 1 tsp oil in a medium sized frying pan, add onions and cook over medium high heat until starting to soften slightlyTurn heat down. add sugar and balsamic, cover with lid and cook for a further 15 minutes. Remove lid, turn heat up again and cook another 5 - 10 minutes to gently caramelize the onions. Remove from pan and set aside. 3. Roll dough out into a rectangle large enough to fill a casserole dish - dough should not be too thin. Transfer dough to a greased casserole dish, smoothing into all the corners and up the sides of the dish. Spread the bottom with pesto, then scatter with onions and top with aubergines. Finish off by seasoning to taste with salt and finally add creamcheese rounds on top. 4. Bake for 15 minutes at 180C, then adjust heat for grilling and return to oven for another 5 minutes until gently browned on top. 5. Drizzle with balsamic reduction, cut into slices and serve while still warm or lukewarm. Simply gorgeous and I am loving the taste which I can imagine already. Great recipe! Thanks Trish - do give it a go, it's simply divine. I have such a crush on aubergines... Thanks for another great recipe! This is a lovely way to eat aubegines. Roasted. Yum. Now this is totally my type of dish. If I were around I would probably run of with the thing and demolish it all on my own! Oh. My. Word. How spectacularly good that looks!